Koru began as an intensive business program to prepare and connect recent college grads to real-world careers. Challenge: Koru was in its early stages when I joined their team to take on the redesign of their website and refine their brand. Process: Working closely with the VP of Marketing and the Content Manager, we swiftly launched a redesign and migrated the site into a CMS, while simultaneously refining the Koru brand. After the initial launch of the website, we conducted usability studies to distinguish what content was most clear (and appealing) to our users. Outcome: The result was a beautiful and modern mobile-friendly website with imagery and content geared toward a Millennial audience. Bounce rate decreased 21%, and average time on the site increased 24%. Koru's old website was outdated, visually unbalanced, focused heavily on the company instead of the user, and didn’t follow best practices for UX copy. Challenge: As a quickly expanding venture-backed start-up, Koru needed to establish guidelines for communicating its brand. The goal was to provide content creators with universal principles for maintaining consistent visual and written elements. Process: I worked closely with the Content Manager to create a style guide which covered a brand overview, writing guidelines, and visual guidelines. It was a collaborative process to establish a consistent personality between written and visual elements. Outcome: I proposed that the style guide be modeled after a living style guide and be implemented on the website. This ensured that there was only one master style guide to reference, instead of an inevitable out-of-date PDF circulating. The style guide was implemented in a CMS, so it's easy to update when anything changes. Challenge: Expand email database, increase web traffic, and ultimately convert users to sign up for the Koru Program. 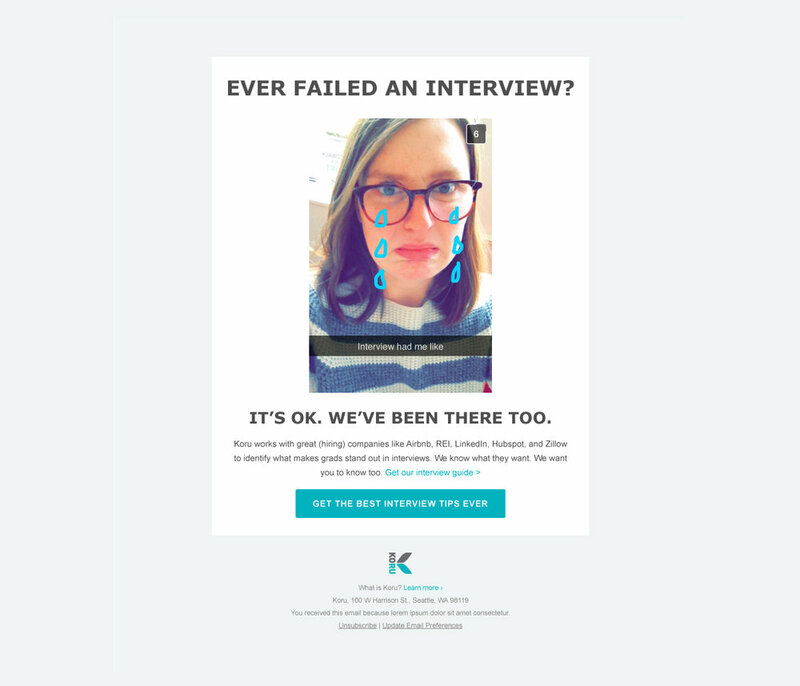 Process: I worked with Koru's Content Manager and VP of Marketing to create a series of ads, emails, and gated content. We created content-focused emails to keep leads warm before a program launch and redesigned our blog to make it more Millennial-friendly. Outcome: We doubled our email database and as a result blog readership increased by 97% quarter-over-quarter and 509% in 2015. Tara is a phenomenal UX designer and a fantastic strategic partner. She invests herself in understanding customer perspective and strategic direction, and ensures that she's a key partner in development and growth.